The first semester of PT school is challenging for a variety of reasons. You’re moving to a new location, starting a higher level of education, and taking on more responsibility. Personally, the transition from undergraduate to graduate school came with a learning curve. Below, I give you five tips to ease the transition. It may sound obvious to try and relate what you are learning in PT school to your future clinical practice, but the execution of this thought is crucial. The goal of learning should not be centered around “How will I pass this practical?” but rather “How can this information be used to enhance the quality of life of my future patient?” This helps the information become more relevant, and therefore memorable. Who wants to study Anatomy just to know anatomy? The whole point of knowing all this anatomy is so you can use your knowledge to solve someone’s problem in the near future! Keep the end goal in sight, increase your own personal buy-in to your investment of PT school, improve future patient outcomes, and truly learn the material by consistently keeping this thought in the forefront of your mind. We have all been in a position where we are passively studying, reading through the notes, and hardly digesting the material. You could do this for six long hours that are neither productive nor pleasurable, or you could focus with your cellphone off for an hour and get more out of that one hour than an agonizing day of distracted “studying.” You must take an active role to really connect with the information and make it part of your treatment arsenal. The same goes for feeling refreshed! You can’t keep high quality work throughout the day without ample mental breaks in between. I fell into a bad habit my first semester of trying to continue working through my relaxation time. In theory it sounds great — I’ll just have the game on and passively flip through flashcards. However, it doesn’t end up working out; I found that I would get to a point where I felt I was never actually getting a break from school. While initially you might be able to pull it off, eventually you will hit a wall and be subjected to the diminishing returns of your efforts. The same quality lesson from studying applies to resting: find activities that replenish your energy and invigorate you. This is a good lesson for all aspects of life. It’s also a lesson I re-learned in my first semester of PT school. When you exit an exam, the doors open to reveal a group of your classmates standing around discussing exams like we were seagulls standing around a piece of bread at the beach. Students tend to go back and forth, saying “What did you put for this one?” with various rationales for why he or she is wrong. I found that it just makes me feel worse about how I did. Just because everyone on the boat is panicking doesn’t mean it is in fact sinking. Just focus on being your best you and not how that matches up with your cohort. Your skill set and experiences are unlike anyone else’s. Ask yourself: What would this look like if it was easy? I initially heard this question from Tim Ferris, a tech investor. It is such a useful question to ask yourself because often we humans tend to make things more difficult than they need to be. During the first semester of PT school, I was the living embodiment of this tendency. Everything was life and death and I built up this huge barrier between me and my education, only increasing my difficulty. PT school will certainly challenge you in many ways, it will expose some of your short comings, and you will have to push past your belief system in order to grow professionally, academically, and personally. Asking yourself “What would this look like if it was easy?” can provide you with a different lens through which you can view your problems, and this lens tends to provide more actionable steps toward success. For my first semester of PT school grades were everything. So much so that I was afraid of being wrong. Having this mental outlook on being wrong, whether it be in discussion or on an examination, hinders your learning because true learning occurs when you are incorrect. Embarrassing yourself in front of someone by being wrong creates those well, I will never forget that the Brachialis is the workhorse of elbow flexion type of moments. You should expect to be wrong on your path to being a healthcare provider—you have quite a lot to learn! Go forward unafraid of the specific grades received and of being incorrect; instead, focus on developing the clinical critical thinking skills you will need in the future. I hope at least one of the above points sticks with you and aids you during your transition towards becoming a successful physical therapy student! 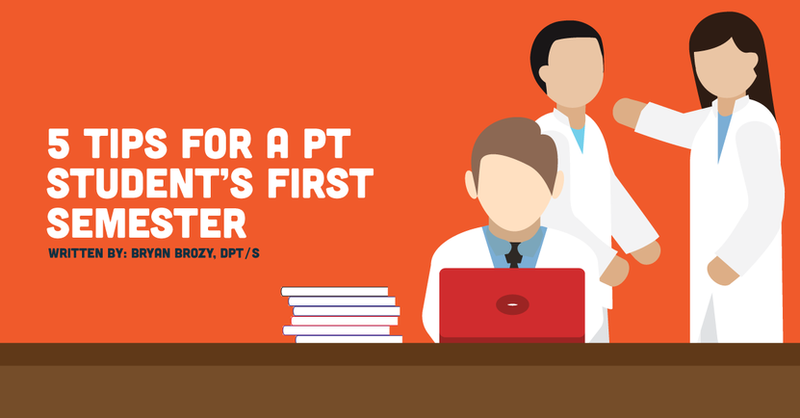 Are you a current PT student or recent graduate, and do you have any advice to add? Let us know in the comments!